Dive right in with the brave, diverse girls of the Junior Lifeguards as they continue their summery adventures on Cape Cod, where ice cream, miniature golf, and sand-between-your-toes combine with beachfront bravery and life skills for wholesome summer days and nights! 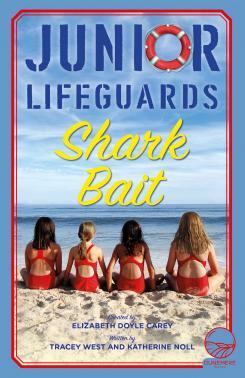 In SHARK BAIT, local stablehand Piper Janssens is struggling to feel confident in her new role as a lifeguard. Her natural strength, good instincts and work ethic make her a standout rookie on the squad, but her insecurity could be her undoing. Add to that an ethical dilemma with a senior guard texting on the job, a catering gig gone wrong, and some near misses with sharks in the wild, and this book will have readers’ pulses racing! Mentor and cutie Luke Slater is both wise teacher and crush in this story, where Piper learns to trust herself and follow her gut. Shark Bait is about paying attention, having confidence, following tough rules, and giving a job your all. It’s also about dinner picnics, chowder tastings, summery shopping and cute boys on the beach.